This post is sponsored by Old El Paso. I was asked to be one of their Freshest Bloggers this year so you’ll see some fun Tex-Mex action occasionally. 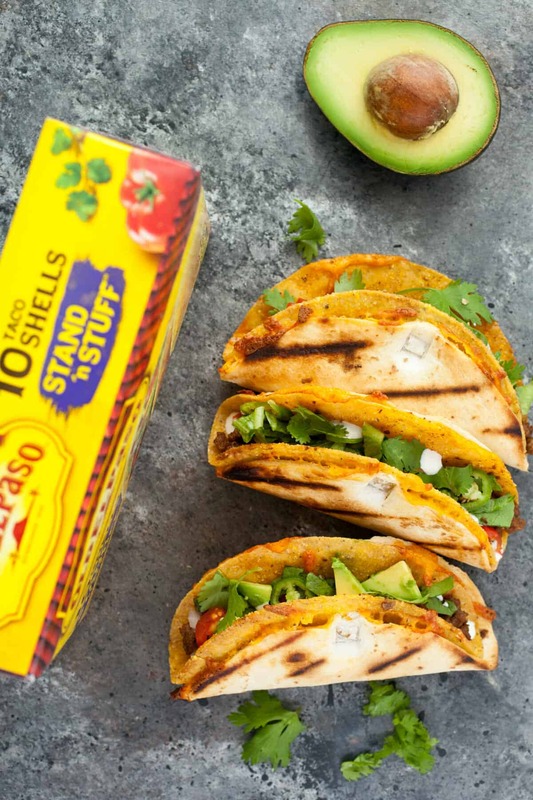 This recipe is great with their Stand 'n Stuff Taco Shells! Sometimes a recipe reminds me how completely fun it can be cooking something at home. 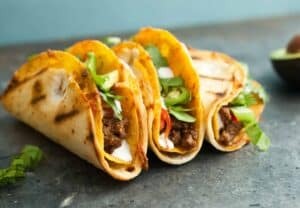 These Quesadilla Taco Shells did exactly that for me. I loved the idea of having a taco shell that had cheese sandwiched between two layers. It’s sort of the best of both worlds for the indecisive Tex-Mex lover: Quesadilla or taco?? I tried a few different ways to make this dream happen, but the tricks that finally got me there were two: First, clothespins! Second, I like to make them on a grill because you can spread them out and not worry if the clothespins burn a tiny bit. Making them in a skillet is possible, but trickier and you have to work in batches. It’s springtime though, so heat up the grill and toss these on for some fun Tex-Mex treats! Want to kick your taco game up a notch this year? 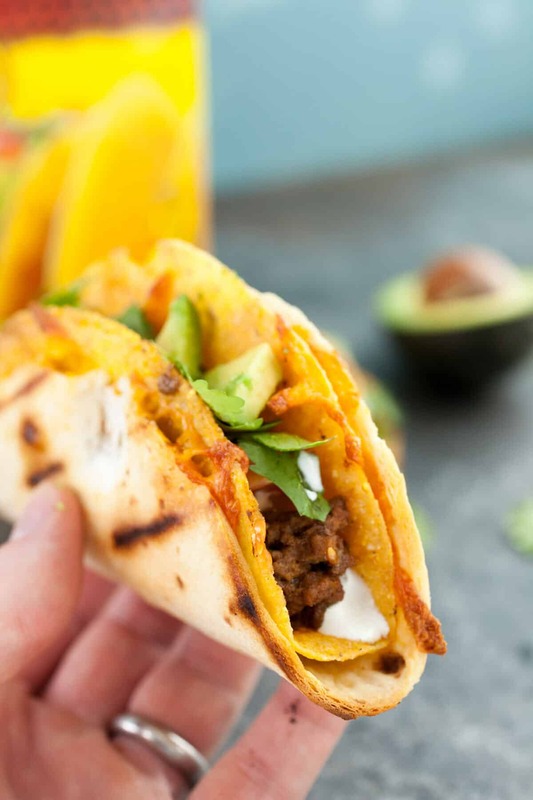 Make these delicious quesadilla taco shells and stuff them to your heart’s desire! Preheat your grill to medium heat. 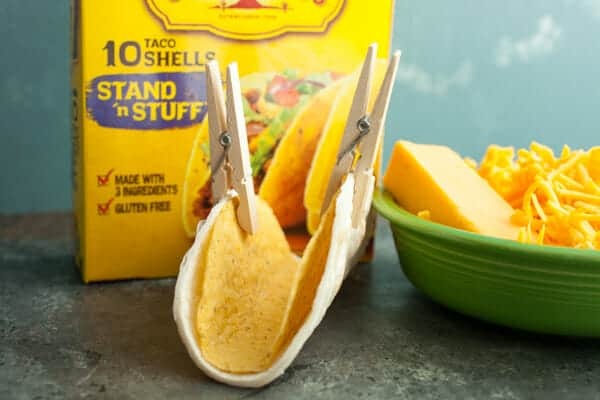 To make sure your flour tortillas fit well over the Stand ‘n Stuff taco shells, wrap the flour tortillas around them and secure them with clothespins. If the flour tortillas overhang around the corn tortillas then trim them so they fit. 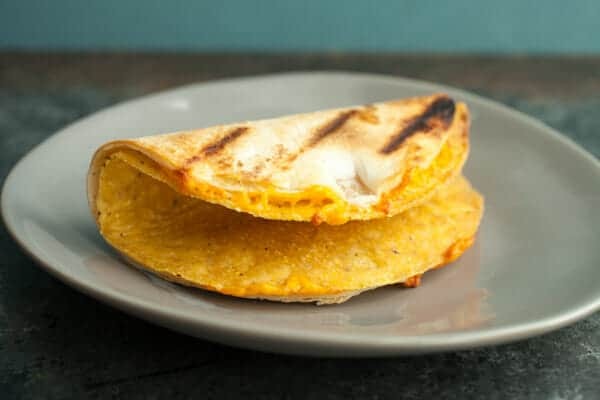 2) When your grill is hot, add a small amount (about 1 ounce) cheese evenly over the flour tortilla and set the stand ‘n stuff taco shell on it. Secure each side with a clothespin to keep it locked in place around the taco shell. Brush the outer sides of the flour tortilla very lightly with canola oil. 3) Grill the taco shell for 2-3 minutes per side until the flour tortilla has nice grill marks and the cheese is melted. 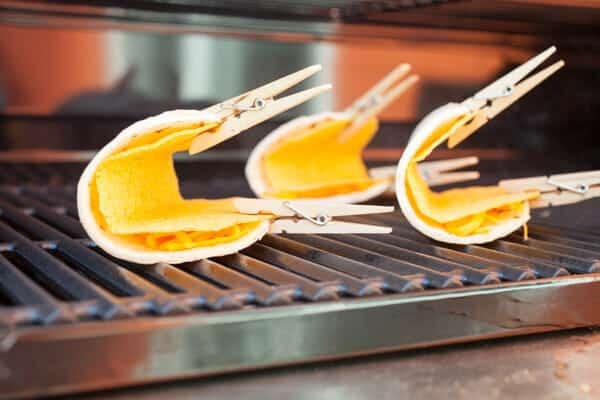 Keep the clothespins on while grilling! 4) The taco shells are done when you can remove the clothespins, the taco shell should be a solid pieces and the outer flour tortilla should be stuck to the crispy taco shell. Fill with toppings of your choice and enjoy! These guys have crispy corn taco shells on the side and a soft flour tortilla on the outside. I like to use Stand ‘n Stuff taco shells just because they give you a bit more room to work with since they are wider. You may need to trim your outer flour tortillas a bit to make them fit. You don’t want a lot of overlay. Then use clothespins to keep the two secure until they can cook together! Add some cheddar cheese to each flour tortillas before securing it so the cheese is sandwiched between. I tossed this version on the grill. Hopefully it’s apparent why a grill is a better idea than a skillet. It just gives you more room to spread out! 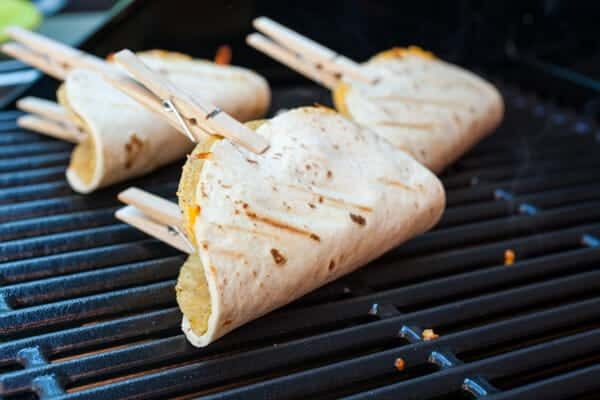 Before you toss the tacos on, I recommend brushing the outer flour tortillas with a little canola oil just to make sure there is no sticking at all on the grill. After a few minutes on each side (over mediumish heat), you should get some grill marks on each tortilla. When the taco shells are done, the outer shell will be completely bonded to the crispy taco shell! My favorite part is the crispy bits of cheddar on the edges. Of course, once these quesadilla taco shells are made you can fill them with any Tex-Mex filling your heart desires! I chose a really simple classic ground beef filling for my version, piled high with veggies and queso fresco as well. This isn’t a recipe for a rushed weekday by any stretch, but if you are in the mood for something fun for a casual weekend Tex-Mex meal, start with these shells. They are a blast to make and very delicious! WOW! How fun is this – will be doing this for Sunday dinner! Thanks, Nick! Oh, wait, I have to buy clothespins! So trying this. Wicked fun and clever twist on tacos! Do you think it would work to make the shells in advance and then just reheat with filling in the oven? I’d like to make them for guests but I don’t want all the work while they are here. You have no idea how much I love this idea. Not only does it mean more cheese (Mmm) but the soft tortilla will catch the taco innards when the crunchy shell inevitably breaks. Crunch + containment. I love it. Mexican food is a favourite cuisine of my family’s! You have just inspired me as to what I’m making for dinner tonight!